“Christ in you, the hope of glory” (Col. 1:27). We believe that the greatest and most urgent of all our needs is a revival of true godliness, which is true biblical spirituality, or having Christ formed in us by the Holy Spirit (Gal. 4:19; Col. 1:27). Such spirituality is not natural to the sinful person who regards it as foolishness: “The natural man does not receive the things of the Spirit of God” (1 Cor. 2:14). A vital part of discipleship and the training of gospel workers at the Seventh-day Adventist Theological Seminary is to enable them to cul­tivate genuine biblical spirituality through justification and the process of sanctification, for it is impossible for them to give others what they themselves do not have (Acts 4:13; 1 Cor. 6:11; 1 Pet. 1:2). As in all matters of faith, Christians of the twenty-first cen­tury need to safeguard their beliefs and practices about spirituality to ensure that they do not depart from biblical principles. In today’s postmodern, pluralistic world, with its multiple influences from Eastern non-Christian religions, animism, New Age, and other sources, the meanings of concepts related to “spirituality” and “spiritual forma­tion” have become ambiguous and conflicted. Some terms once used freely by Adventists have become controversial. For example, the term spiritual is now used by some in today’s culture as a generic, all-inclu­sive word for sensory emotional, physical, intellectual, or relational experiences intended to build a positive relationship with a nebu­lous “higher power” either inside or outside of the self. Sometimes spiri­tuality is associated with nonbiblical practices such as “centering prayer,” or “prayer labyrinth.” Part of the challenge is that some words used to convey biblically faithful meanings can also be used to convey biblically unacceptable meanings. Biblical spirituality can be defined as the process of the divine resto­ration and healing of the broken relation between the Triune God and humanity. As such, biblical spiritual­ity is the response of a repentant human heart and mind to the loving heart and mind of God (1 Cor. 2:12, 13; Rom. 8:14). God created us in His image with the capacity to communicate with Him in a per­sonal relationship. This capacity and relationship were fatally distorted by sin (Gen. 1:27; 3:1–9). It is God who calls us to Himself, vivifies the lifeless spiritual capacities of the sinful human heart, and leads us to know, love, depend upon, and obey God (Gen. 3:9; John 17:3; Col. 1:21–23; Eph. 1:17–19; 2 Pet. 1:2, 3). Initiated by God, biblical spirituality is a conscious walk with God in which we enjoy His awesome presence, and live in dependence upon Him. The Holy Spirit, through the Holy Scriptures, reveals to us the deep things of God (1 Cor. 2:9, 10; Eph. 3:14–20; 4:13), our sinfulness and lostness, and our need for the Savior Jesus Christ who took upon Himself our sins and died in our place (John 3:16, 17; 16:8–11). Biblical spirituality is further deepened as the Holy Spirit prompts spiritual desires and leads us to consider and accept instruction from God’s Written Word (1 Cor. 2:13; Ezek. 37:4–6; Eph. 6:17; Heb. 3:7; 4:12; 6:4, 5; 2 Pet. 1:21), and to behold and experience God’s character of love (Exod. 34:6, 7; Rom. 5:5; 1 John 4:16). By behold­ing the attributes of God (1 Chron. 29:9–13; 2 Cor. 13:14; Heb. 12:2; 1 Pet. 1:2; Jude 20; Rev. 1:4–6), we are inwardly changed (2 Cor. 3:18), transformed by the renewing of our minds (Rom. 12:1, 2), where our vision of God causes the spirit of this world (1 Cor. 2:12; Eph. 2:2; 1 John 4:3) to lose its influence and power upon us (Rom. 6:11–13; 8:10; Eph. 2:1–10; Gal. 6:14). Concerning this, Ellen White states, “As we meditate upon the perfections of the Saviour, we shall desire to be wholly transformed and renewed in the image of His purity.”4 Thus, self is crucified with Christ and Christ lives in us (Gal. 2:20). The repentant sinner experiences blessedness and joy (Pss. 1:1, 2; 32:1, 2; Rom. 4:7; Phil. 4:4), peace with God (Rom. 5:1), assurance of salvation (Rom. 8:1), no fear of judgment before God (Isa. 35:4; Dan. 7:22; Luke 1:74, 75; John 5:24; 1 John 2:28; 4:17, 18), and love for one another (John 13:35). Upon invitation, the Holy Spirit causes a spiritual person to walk in all the commandments of the Lord (Ezek. 36:26, 27; John 14:15), which otherwise are impossible to observe (Josh. 24:19). Spiritual growth results in the presence of the fruit of the Spirit and spiritual gifts bestowed by the Holy Spirit for service to others (Gal. 5:22, 23; 1 Cor. 12; Col. 3:12–15; 2 Pet.1:4–11). This dynamic spiritual life, born of God, gives victory over the powers of darkness (2 Cor. 2:14; Eph. 6:10–18; 1 John 4:4). It springs into a desire to surrender self to God in faithful obedi­ence, heartfelt worship, and unselfish service to others (Isa. 6:1–8; Matt. 25:31–46). Repentance, confession, and consecration become an integral part of our enduring connection with God (Ps. 32:1, 2; Joel 2:12–18). To live is Christ (Phil. 1:21), and there is reason to boast in His cross alone (Gal. 6:14; Jer. 9:23, 24). All of life is lived in the blessed hope and anticipa­tion of Christ’s soon return (1 John 3:3; 1 Thess. 4:13–18; Titus 2:11–14; Rev. 22:10–15). In sum, a divinely effected spiri­tual life stands in direct opposition to living according to the flesh (John 3:6; Rom. 8:5–14; 1 Cor. 2:12–14; Gal. 5:16–6:1). Biblical spirituality means to be born of God (John 1:12, 13; 3:5–8; 1 John 4:7), be changed by the grace of Jesus Christ (Rom. 12:1, 2), surrendered and obedi­ent to the Spirit, living according to the Spirit (Rom. 8:4–11), and consequently empowered by the Spirit to draw others to find life in the Spirit. This is the process of sanctification concerning which Ellen White writes, “The sanctifica­tion of the soul by the working of the Holy Spirit is the implanting of Christ’s nature in humanity.”5 Thus, biblical spirituality both reflects and engenders a worldview about the holy, gracious, and attractive Triune God in relation to the human self in which the true restoration and healing of the broken relationship between God and humanity is vitally experienced in the context of the great controversy between Christ and Satan, good and evil. In our study of personal practices of spirituality at the Seventh-day Adventist Theological Seminary, we uphold biblical principles and reject nonbiblical concepts. 1. We affirm the priority of Scripture to guide our lives. The Word of God is the medium through which God communicates with the minds and hearts of individual humans and is foundational to any genuine spirituality. Faith comes by hearing the Word of God (Rom. 10:17). It is through the Word that we are sanctified (John 5:39; 17:17). 2. We affirm the love of God for a lost world. Scripture states that God’s love for humanity is the basis of His attempts to establish a rela­tionship with us (John 3:16; 1 John 4:8–10; Gen. 3:9). The more clearly we perceive the love and character of God, the more we love and worship Him and love and respect our fellow humans. 3. We affirm the preeminence of Christ. Scripture states that there is no fullness of coming to God without Christ who is the fullest revelation of God’s character and life (John 14:9–11), and who is the way, the truth, and the life (v. 6). While ministering for us in the heav­enly sanctuary, Christ imparts His life, merit, and grace to our hearts through the Holy Spirit (Rom. 5:8; 1 John 2:1, 2; Heb. 2:9–11; 8:1, 2). 4. We affirm the substitutionary atonement of Christ. Biblical spiri­tuality revolves around one’s need for a Savior who died for us on the cross (Rom. 3:24, 25; 1 John 3:16). Elements of repentance, confession surrender, cleansing of the heart, and renewal are part of one’s new life, as well as radical transformation of life—we no longer live for ourselves but for Him who lived and died for us (Gal. 2:20). 5. We affirm the work of the Holy Spirit. Biblical spirituality is not possible except at the initiation of God through the Holy Spirit (John 3:6–8; 16:8–11; 1 Cor. 6:9–11; Titus 3:5–7). He is the One who brings life, mediates, and illuminates the Word of God to our minds, taking our innermost groanings to God (Eccles. 3:11; John 14:26; 16:13; Rom. 8:22–27), helps us to discern spiritual things (1 Cor. 2:14), and leads us in our spiritual journey (John 16; Rom. 8:14). We live, pray, and come to victorious life in the Spirit (Gal. 5:25; Jude 20). 6. We affirm that communion with God takes place at His initiation through His revelation to us in Jesus Christ. Christ’s presence with us and in us is realized by the influence of the Holy Spirit through the Word of God (1 Cor. 2:10–13) as well as through providential workings of His grace and thought impressions (Eph. 1:17, 18). All such influences, however, are to be tested by the Word (2 Tim. 3:16). 7. We affirm the role of the human mind in Christian spirituality. Biblical spirituality results from our renewed mind coming into contact with the mind of God through Scripture and the Holy Spirit as we meditate on and accept the Word of God (Rom. 12:1, 2; 1 Cor. 2:10–13; Phil. 2:5; Ps. 1:2; John 7:17). 8. We affirm the role of the physical human body. That the human being is a living soul rather than having a separable soul is key in understanding the nature of biblical spirituality. The mind and the body form an integral unity that cannot be divided (Gen. 2:7). The body is the temple of the Holy Spirit (1 Cor. 6:19). 9. We affirm the positive role of human feelings and experience in biblical spirituality as represented in the fruit of the Spirit (Gal. 5:22, 23). As noted, we believe all human experience is to be tested and evaluated by Scripture (Isa. 8:19, 20; 2 Tim. 3:16). 10. We affirm the proper appre­ciation of the good things in nature that God has given to us as wit­nesses of His kindness and other attributes (Pss. 19:1, 2; 139:13–18; Rom. 1:19–21; Acts 14:17), which prompt us to worship Him as our living and loving Creator (Rev. 14:7). 11. We affirm the healing power of Christ (Matt. 9:35) from sin and the results of sin (Ps. 147:2; Isa. 51:3; 1 Cor. 1:3, 4). His healing power continues to be manifested through the name of Jesus Christ (Acts 3:6), proper lifestyle, godly physicians, ministers, and mental health profes­sionals, as well as human families as they express God’s love to one another (2 Cor. 1:3; Matt. 10:1). God also works through miracles of healing as He wills (James 5:14, 15; Acts 3:3–10; Mark 16:17–19). 12. We deny that all study of the Word of God, all prayer, and all behaviors of service and devotion are performed under the influence of the Holy Spirit. Sinful humanity has the ability outwardly to do some of these good things, but for the wrong motives or sometimes in a routine fashion devoid of meaning. It is easy for the unrenewed human mind to become blinded by human learning and service and not be actuated by the Spirit (1 Cor. 1:20–25). 13. We reject methods of seeking to “experience” God by an emptying of the mind or an altered state of consciousness. 14. We deny that humans have a soul that connects with God apart from our physical brains and bodies. 15. We reject all varieties of so-called spiritual practices that are inconsistent with Seventh-day Adventist beliefs. Following is an illustrative list of practices we reject: invoking ancestral and other types of “spirits” and various “deities” like the “goddess mother” (Rom. 1:21–23; 2 Thess. 2:10–12); invoking cosmic powers, sun, moon, stars, and other things such as rivers, oceans, mountains, trees, and animals; the idolatrous use of objects for worship or contemplation (Exod. 20:3–6); the veneration or worship of humans, living or deceased (Acts 14:12–15); prayer labyrinths, mantras, tantric rituals, prayer wheels, or yoga contemplations; magic, fetishes, or spiritualistic séances; practices that intend to manipulate or coerce God to reveal the future, solve human problems, heal illness, or provide benefits. In our understanding of the dynamics of spirituality, we uphold biblical examples and teachings and reject nonbiblical concepts. 1. We affirm biblical devotional practices. The Bible speaks of regular patterns of personal spiritual disciplines such as prayer (Matt. 6:4–15), reading and meditating on God’s Word (Matt. 4:4; Luke 10:26), personal and corporate wor­ship (Luke 4:31), and fasting (Matt. 6:16–18; 17:21). 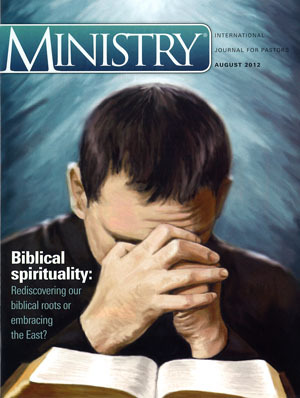 Prayer is central to the spiritual life of the believer (Eph. 6:18). It is the pouring out of the heart before a loving heavenly Father, in confident expectation, and yet humble submission. Spiritual practices also include matters of stewardship (faithful giving of tithe and offerings—Matthew 23:23; 6:2–4; how we relate to finances and the things of this world—Acts 20:35; 1 Tim. 6:7–10) and Sabbath keeping (worship of God the Creator, service, rest, and celebration—Exod. 31:13; Luke 4:16; Mark 2:27, 28; Matt. 12:9–14; Acts 16:13; Heb. 4:9, 10). 2. We affirm the importance of following the example of Jesus in one’s daily life and in the practice of spiritual disciplines (Mark 1:35; Luke 4:15, 31; 1 John 2:6). Other key biblical patterns of spirituality include, but are not limited to Daniel (Dan. 6:10; 9:3), David (Ps. 119:97), Elijah (1 Kings 19:9–18), and other prophets in Israel (2 Kings 19:1, 2). 4. We affirm the role of com­munity. Spirituality today is often seen as individualistic rather than communal, thus one assumes that one can be spiritual but not religious; spiritual, and not part of a faith community. But biblically the community is the context for spiritual growth, nurture, account­ability, expressing our spiritual gifts, service, and learning tolerance and unity. Corporate worship is also an integral part of our spiritual growth (Acts 2:44–47; 1 Cor. 12; Eph. 4:11–15; Heb. 10:25). 5. We affirm an end-time context to spirituality. The biblical teaching about the time of the end frames biblical spirituality in such a way that Christians can experience now a fellowship with God and yet at the same time sense an incompleteness to such a relationship with God. Furthermore, there is an apocalyptic dimension to biblical spirituality that heightens one’s experience with God and life lived in the world (1 Pet. 4:7). There is an urgency of experience that is ours because of our view of the return of Jesus—we long to see Jesus and the nearness of His coming heightens our expectation (Titus 2:11–14). At the same time, we are warned to be aware of false spiritual revivals (Matt. 24:23–26; 2 Thess. 2:9–12). 6. We deny that spiritual prac­tices earn us any increased standing with God. Our salvation is through the sacrifice of Christ alone, by His grace accepted through faith (Eph. 2:8–10). Biblical spirituality, at its core, refers to a life of discipleship inten­tionally lived in personal relationship with God through Christ by the Spirit. The life lived with God is such that “we, being delivered from the hand of our enemies, might serve Him without fear, in holiness and righ­teousness before Him all the days of our life” (Luke 1:74, 75). Thus, biblical spirituality includes conver­sion, justification, and sanctification (1 Cor. 6:11). It is about everything that we are and do in life, because even the common things reflect our spiritual orientation. The biblical teaching regarding spirituality emphasizes God’s initia­tive in establishing a relationship with humanity and provides multiple examples of how one can grow spiri­tually until “we all come to the unity of the faith and of the knowledge of the Son of God, to a perfect man, to the measure of the stature of the fullness of Christ” (Eph. 4:13). Thus, a spiritual person is one who has been converted to God, accepting from Him new life; who seeks to live continuously in the presence of God; who is grateful for His gifts; who loves truth, justice, and service; who is nurtured by spiritual disciplines; and who is humbly mindful of his or her weakness and ignorance (Mic. 6:8; Matt. 25:35, 36). Biblical spirituality in terms of walking with God implies being in relationship with God as were Enoch and Noah (Gen. 5:22; 6:9)—con­versing with Him, believing in and actively seeking His companionship in all the valleys, mountains, and plateaus of life. We do not have to go anywhere special or do anything exceptional to seek God. He is seek­ing us through His Holy Spirit, and we are responding to His love con­tinuously drawing us. We respond to Him in faith (Heb. 11:6), by talking with Him as a friend (John 15:15) in formal and informal prayer, reading, and meditating on His Word as did David (Ps. 119:97), confessing our sin and accepting His cleansing (Ps. 51), praising Him (Ps. 146:2), and assembling with His people (Matt. 18:20; Heb. 10:25); and serving God and humanity (James 1:27; 2 Pet. 2:11, 12; 1 John 3:16–19). While voted by the seminary faculty, this statement makes no claim to finality. Nonetheless, it offers us an opportunity to exalt our heavenly Father, to uplift our Savior and Lord Jesus Christ, and to marvel at the transforming work of the Holy Spirit. We experience a renewed sense of our dependence on God in these end times, and a deepening desire to be used of God to facilitate biblical spirituality in the lives of our seminary students. Seventh-day Adventists value the insights Ellen White provides on the subject of biblical spirituality. Some of the best material on various spiri­tual disciplines and spiritual growth is found in the following books: Education, pp. 250–261; Selected Messages, bk. 1, p. 121; Steps to Christ, pp. 85–101; Testimonies for the Church, vol. 2, p. 315; Thoughts From the Mount of Blessing, pp. 102–122. 1 All Bible texts are quoted from the New King James Version of the Bible. 2 Ellen G. White, “Blessed are the Meek,” Signs of the Times, August 22, 1895. 3 White, Testimonies for the Church, vol. 2 (Mountain View, CA: Pacific Press Pub. Assn., 1948), 315. 4 White, Steps to Christ (Mountain View, CA: Pacific Press Pub. Assn., 1956), 88, 89. 5 White, Christ’s Object Lessons (Washington, DC: Review and Herald Pub. Assn., 1941), 384. 6 White, Education (Mountain View, CA: Pacific Press Pub. Assn., 1952), 297.